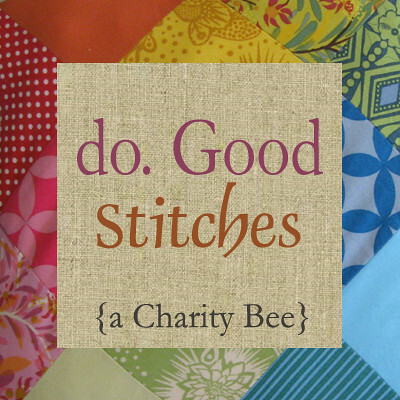 If you’re looking for the Sew Mama Sew Giveaway Day post, it’s here. I’m not sure how it happened, but Christmas is less than 10 days away! 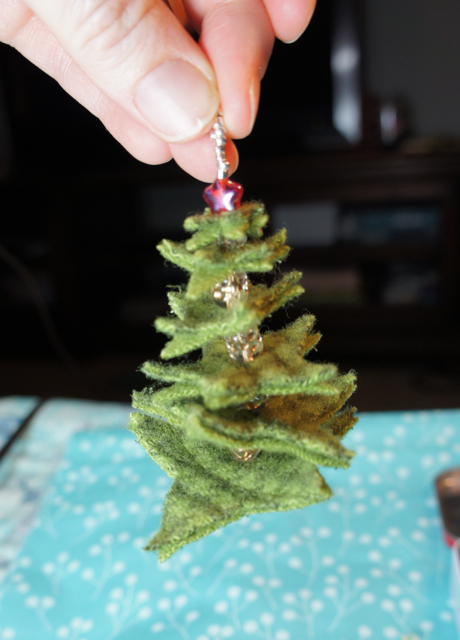 I wanted to share a quick tutorial with you for a felt Christmas Tree Ornament. If you’re still decorating, or perhaps you need a hostess gift, this little ornament might be just the ticket. 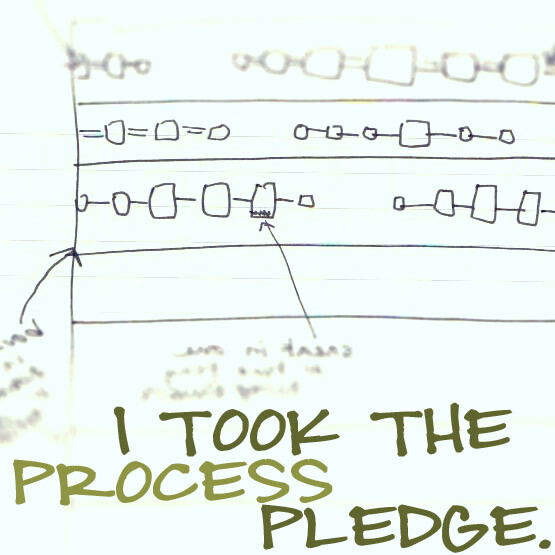 And it only takes about 30 minutes to make! Beads. 2-4 for the “trunk”, 5 fairly large ones to go between the “branches”, 1 to serve as the “tree topper”, and 15-20 seed beads to make the hanger. If you have 3mm felt or thicker, you only need one piece. 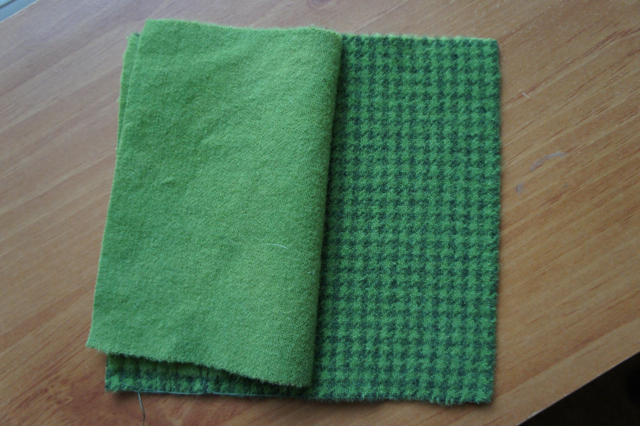 Most fulled sweaters will be thick enough as is, but all I had on hand was this thin green felt. I decided to take two pieces and quilt them together using random straight lines. Cut out the templates, and pin them to your felt. 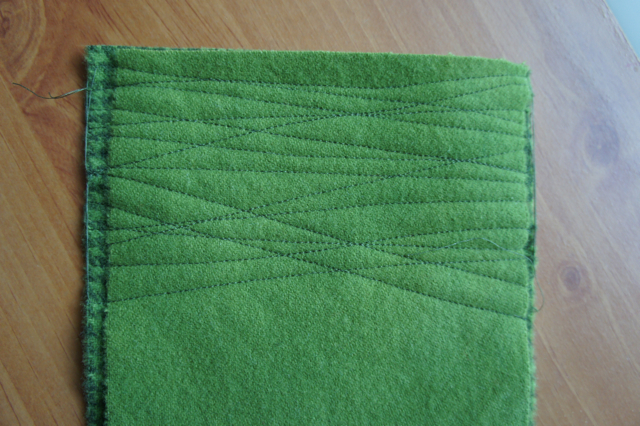 Then cut out the felt pieces. Thread your needle with a longish piece of thread (doubled over) and tie in a knot. Next thread your “trunk beads” onto the needle followed by one seed bead and pull it all the way through. 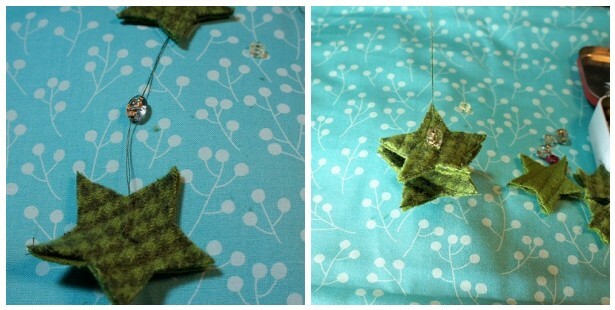 Thread one of the “branch separating beads” and the next largest star onto the stack. Repeat for all remaining stars. 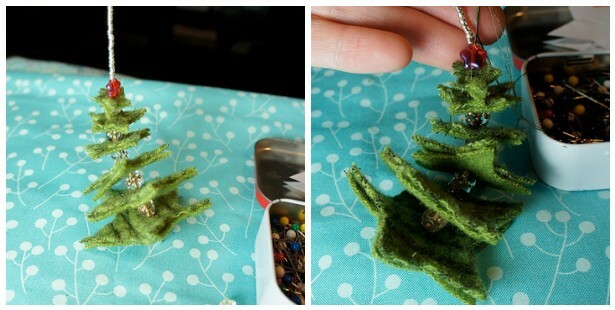 Add your “tree topper” bead. 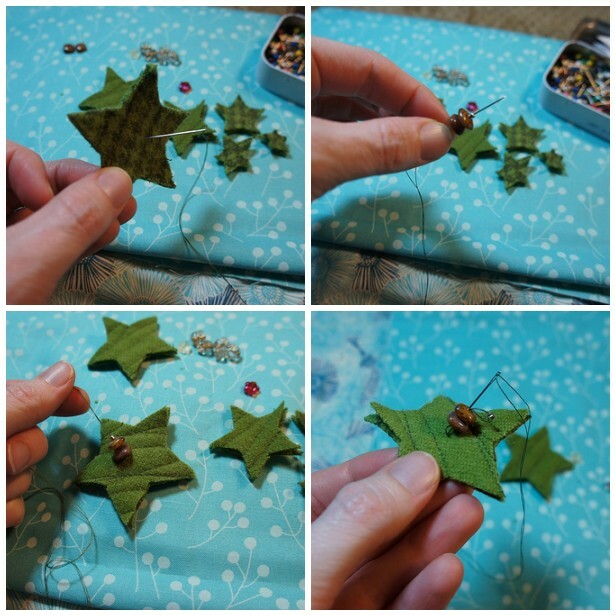 I chose this cute red star, but I have also used large round yellow beads. You can use anything you like, or nothing at all. Now add the rest of the seed beads. I have these sterling silver seed beads left from ages ago, and I really like them for this application. 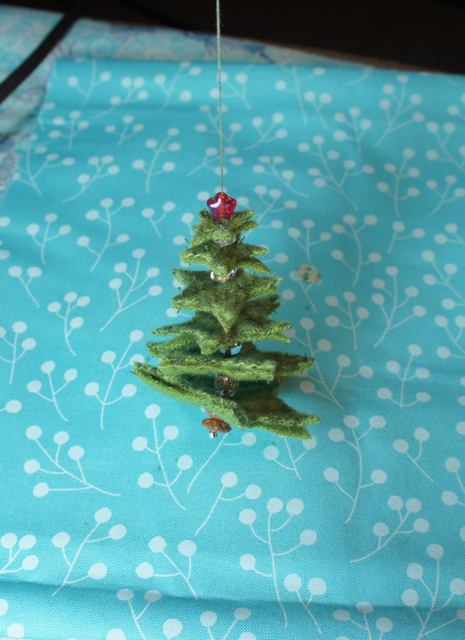 After all your seed beads are strung, insert your needle back into your tree topper bead from the top (or into the top star “branch” if you didn’t use a topper bead). Pull your thread all the way through and you should have a loop. 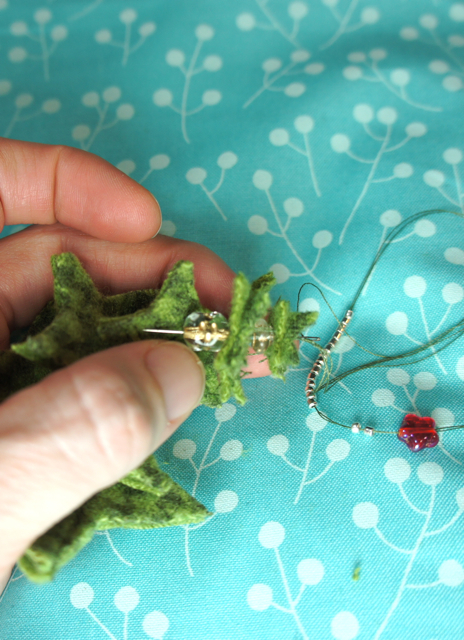 Push the needle back through a couple of “branches” and their separating beads and knot off. And you’re done! I’ve sold I don’t know how many of these in my etsy shop (now closed), so I hope you enjoy making your own. I’d love to see them, if you make one!